Miss. Summaya Munir, a researcher at ‘Comsats Internet Service Research Center for Applications and IT Technologies’ today won second position in the Pakistan Telecommunication Authority Mobile Application Awards 2016 for her project named “Tell Me”. Ms. Summaya received a cash prize of 2 lacs by the Honourable President of Pakistan Mr. Mamnoon Hussain, who was the chief guest at the awards ceremony. Minister of State for IT Ms. Anusha Rehman Khan was also in attendance. “Tell me” was also the recipient of top honours at the “Best IT Innovation Awards 2016 (BITA 2016)” where it was selected in the top 8 innovations after competing in three rounds of competition against 106 other projects from all over Pakistan. “Tell Me” is a product aimed at helping the blind and visually impaired in getting notified about their surroundings, nearby obstacles, the nature of obstacle and even details about its appearance. This innovative technology makes use of a mobile application and the associated hardware which work together to inform the visually impaired person about their surroundings. 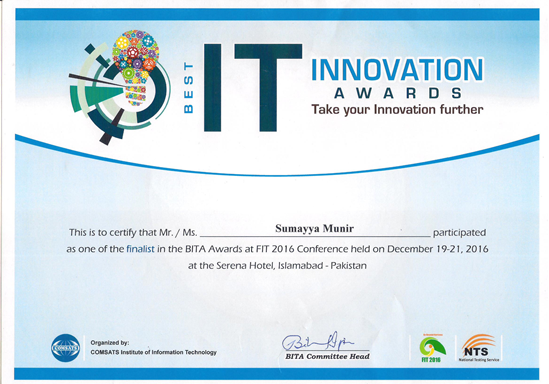 Ms. Summaya’s remarkable work at ‘Comsats Internet Service Research Center’ under the supervision of Mr. Imran Tanveer, an experienced professional in the field of mobile application development and professional trainings, has received remarkable appreciation at many IT forums. COMSATS Internet Services (CIS) officially launched its Research Center; ‘CIS Research Center for Applications and IT Technologies’ in July 2016 for providing a platform for young and talented IT graduates to bring forth their innovative ideas; in doing so providing innovative IT based solutions for ignored community problems. Currently, many graduates from different universities of Pakistan are working on exciting projects related to IOT, Augmented Reality, Medi Health and Virtual Reality at CIS Research Center. Mr. Jamshed, CEO COMSTATS Internet Services, fosters the vision to develop this research center into an incubation center for young IT professionals with ambition to excel in the development of innovative IT products. The Information Technology University (ITU), Lahore hosted four day 9th International Conference on Information & Communication Technologies for Development (ICTD) from 16th to 19th November, 2017. ICTD, being a research conference is aimed towards exploring the role of information and communication technologies (ICT) in global development. It's an ideal place for researchers and practitioners to present their work and form collaborations and networks. COMSATS Internet Services (CIS) also took this a prime opportunity to present its work in the domain of Community Wireless. The Wireless for Communities (W4C) project started in 2010 is a partnership between the Internet Society (ISOC) and the Digital Empowerment Foundation (DEF) with the goal of connecting rural and remote communities to the Internet using a community-focused approach. With a stanch aim to connect rural & remote communities to the Internet and training the community while imparting a positive impact on the society by improving the basic amenities of life (health, education etc. 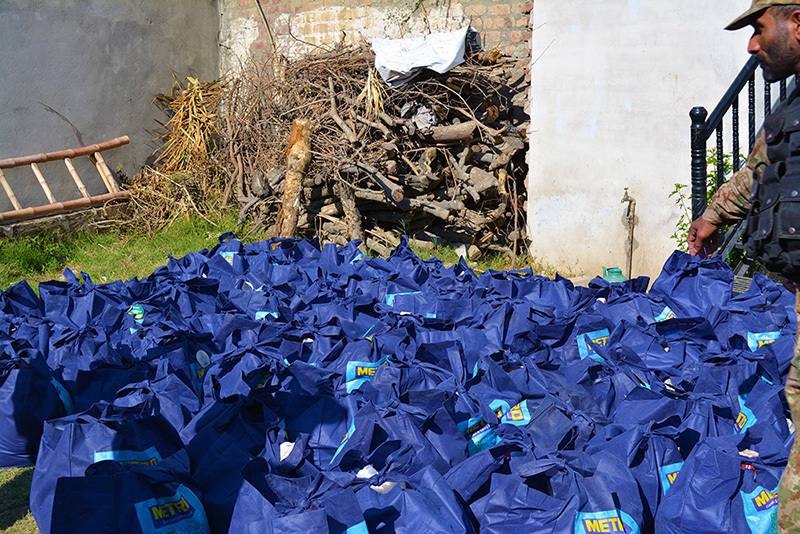 ), this project was co-launched in 2015 in Pakistan by COMSATS Internet Services (CIS) and ISOC to establish a pilot site in Chak Faiz, a rural community in Multan. By far, 2 schools, a polytechnic institute and local community has benefited from this initiative. Both COMSATS Internet Services and ISOC have worked actively and executed couple ground breaking activities under W4C such as provision of connectivity, training and supplement education. The latter initiative was further strengthened as PTA also joined hands with ISOC and CIS in third phase of W4C to add more government level support. In the next phase, CIS aims to connect a school in Gokina; a remote area near Islamabad. The work is already on its way and CIS is currently working on connecting that area and will be launching the supplement education program later this year. Islamabad: Pakistan Telecommunication Authority (PTA) has joined hands with Internet Society (ISOC) Asia-Pacific Bureau and COMSATS Internet Services Limited to provide online interactive remote education to 6thgradestudents of a Government Girls High School in rural Multan; connected last year as part of ISOC's Wireless for Communities (W4C) program. On this occasion, Chairman PTA said that, Government has always been supportive of the ideas that make the best use of innovative technologies. Internet is the nucleus of socio-economic development in the future and this project will introduce the young girls to the benefits of the Internet. 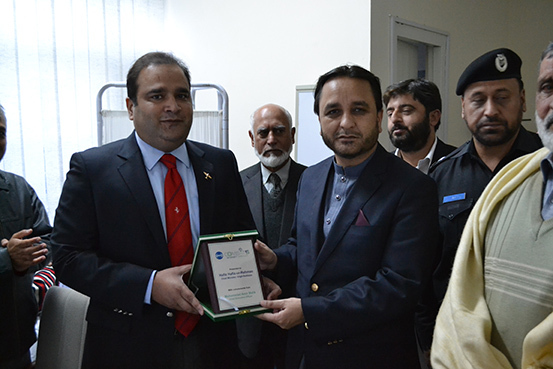 The Government of Azad Jammu and Kashmir Minister for Finance, Planning & Development and Health Dr Muhammad Najeeb Naqi recently visited the COMSATS Internet Services (CIS) Tele Medicine Resource Center at Islamabad for a demonstration of Telemedicine services offered by COMSATS Internet Services. 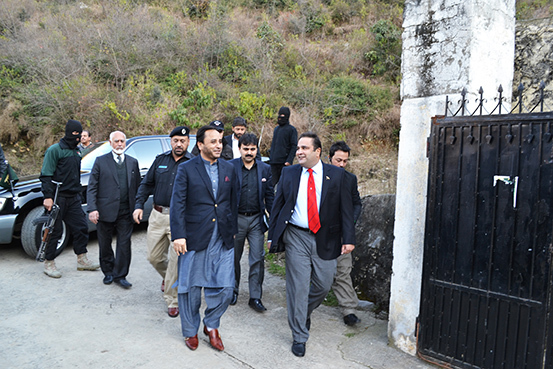 Dr. Khalid Rafique, Director General AJK IT Board accompanied the honourable Minister. Mr. Muhammad Hassan, Project Director COMSATS Internet Services Telemedicine project welcomed the esteemed guests to CIS headquarters and gave a presentation on history and operations of the project. He informed that COMSATS Internet Services (CIS) is the pioneer of Telemedicine services in Pakistan and has established a network of 12 rural clinics in all provinces of Pakistan. 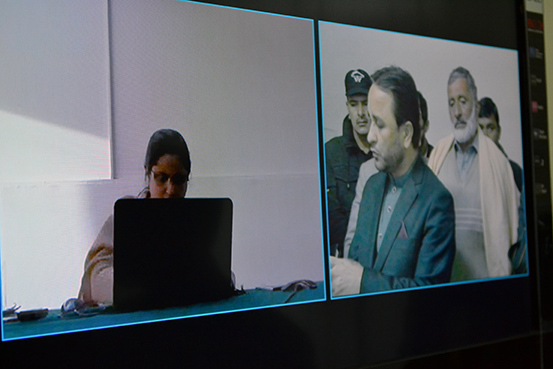 These clinics are connected via broadband Internet with CIS Telemedicine Resource Centre, Islamabad where a panel of specialists provide free medical consultation to patients visiting our remote clinics. These clinics are equipped with latest means of video conferencing, computer systems, necessary digital Tele health diagnostics equipment. Patient's data is maintained on CIS developed web portal for future reference. More than 45,000 patients have been examined and advised so far. Mr. Hassan emphasized the importance of Telemedicine for communities in rural and far flung areas and said that without this technology; the rural communities would have no access to "life-saving health services". He stated that keeping in view the vulnerability of the region to natural disasters and the adverse impact by climate change; Telemedicine could serve as an important line of defence in providing health care facilities to hard to reach communities in the region so that nobody in need of medical care is denied timely health care facilities due to lack of means or connectivity in line with the philosophy of universal access approach. Dr Muhammad Najeeb Naqi, himself a medical doctor took keen interest in the Telemedicine facilities developed by COMSATS Internet Services and the services that were being extended to rural and remote areas through the use of modern technology. Speaking on the occasion; Dr Muhammad Najeeb Naqi said that the AJK government is concerned not only with urban health but also rural, and had initiated many projects and policies for the well-being of all communities. The Government had launched a massive healthcare reforms package to benefit the people of AJK for bringing latest medical facilities to their door step. In addition to launch of emergency services in 11 hospitals, hiring of staff, upgradation and establishment of hospitals and Nursing Schools, establishment of a health regulatory authority was also in process. Dr Muhammad Najeeb Naqi further stated that the AJK Government was fully cognizant of the socio economic needs of its citizens and solid foundation had been laid for uplift of the people of the area, provision of basic amenities of life and accelerating the pace of developmental activities in Azad Jammu and Kashmir. He said that the Government had allocated 6.6 Billion Rupees for the health sector in current budget with the objective to bringing visible improvement not only in the quality of healthcare services but also their accessibility throughout the region. 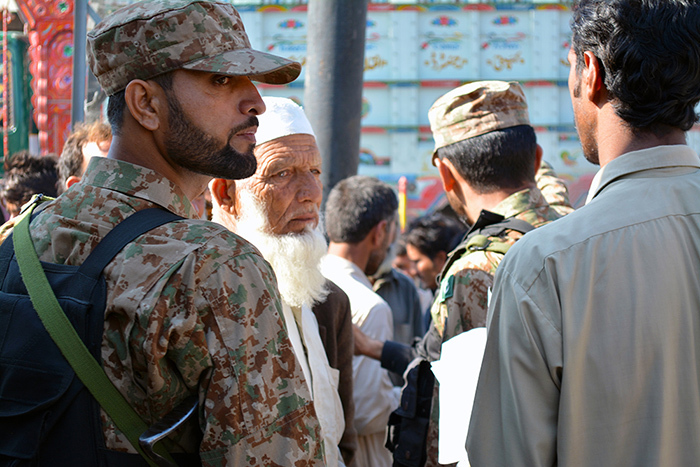 However, he said, still more concentrated efforts are required for universal healthcare access throughout AJK. One of the key strategies for bringing healthcare services to the door step of people of AJK was through use of modern technologies and Telemedicine could go a long way in helping Government address a fundamental problem of health care delivery in all corners of AJK. Dr. Khalid Rafique. 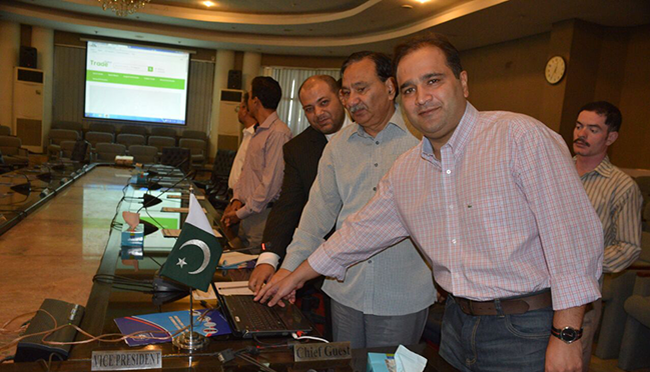 Director General AJK IT Board stated that his organization is steering the digital transformation of AJK to enable socio economic uplift of its people and facilitate efficient delivery of citizen services. He said that due to challenging geography and poor infrastructure resulting from years of neglect, the region faces a big pile of problems; however, the focus and energy of the government in solving practical problems through use of modern ICT tools is yielding positive results. He said that COMSATS Internet Services has a long standing partnership with the Government of AJK and its support in accelerating the digital transformation as well as facilitating citizen service delivery initiatives could be very helpful for the people of AJK. Dr. Khalid also complimented on the Telemedicine service run by COMSATS Internet Services. He said that use of this technology in AJK would not only increase health care coverage; but also give medical practitioners the opportunity to learn more, as well as to perfect their skills through collaboration with large expatriate Kashmiri doctors community abroad. Telemedicine would also act as a platform for sharing information and providing education, public health and administrative services to remote areas. In the end, Mr. Muhammad Hassan, Project Director COMSATS Internet Services Telemedicine project thanked the worthy guests for their visit to Telemedicine clinic and their keen interest in technology and operations. He expressed COMSATS Internet Services commitment to provide technical and operational support in the areas of Internet infrastructure and medical care to enable universal access throughout AJK. Speaking on the occasion; Mr. Tarakai said that the KP government had initiated a process of broad based reforms for improving governance and facilitating use of modern technology to extend healthcare delivery infrastructure to reach people living in every corner of the province. Extending coverage of uniform healthcare facilities to far flung areas was considered an insurmountable problem todate; but with the advancement of technology; specifically Telemedicine; it has now become possible to deliver the same quality and care of health services as is available to residents living in major cities. The introduction of Telemedicine services for remote areas will go a long way in providing timely healthcare services, specially to women and children close to their doorstep. The Government recognizes the importance of healthcare services for all citizens of the province and reforms in this sector is a key agenda of your government on which major investment is being made. Mr. Shahram Khan Tarakai congratulated the Khyber Pakhtunkhwa Information Technology Board for its initiative on launching the Telemedicine facility in Mansehra District in collaboration with COMSATS Internet Services and said that it was heartening to observe that the Board had taken a lead role in the implementing of "Digital KP" strategy to anchor the province's digital transformation. KP IT Board is leading the induction of innovative technology solutions in governance and citizens service delivery challenges in a very effective manner and the Telemedicine initiative is an example of KP IT Board strategy for successful use of modern technology to address a fundamental problem of health care delivery in far flung areas. 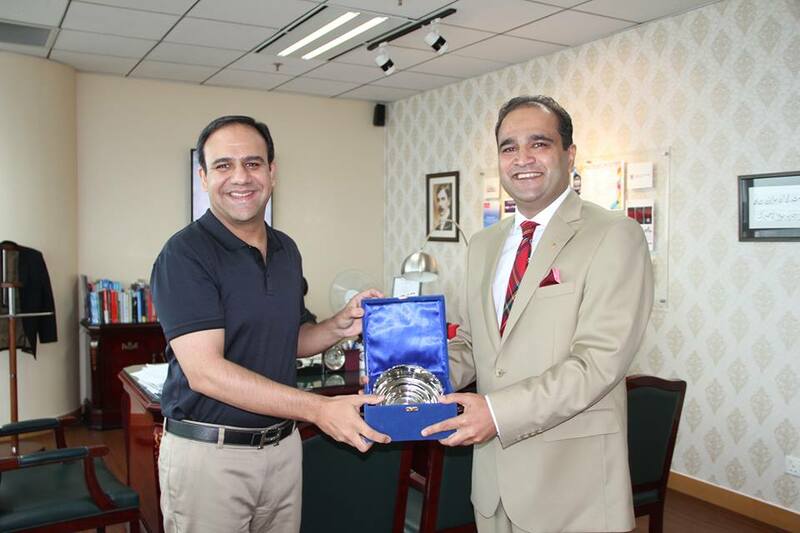 Dr. Shahbaz Khan, the Managing Director of KPITB thanked the Senior Minister Health and IT and stated that the Board will continue to act as a catalyst in the digital transformation of KPK to make the province standout as a role model in eGovernance as well as in efficient delivery of citizen services. With support from experienced partners like COMSATS Internet Services; KPITB will set an example of successful use of innovative technology in every form of citizen services delivery. COMSATS Internet Services is an industry pioneer and the first organization to introduce Telemedicine services in the country. KPITB will benefit tremendously from CIS experience of successfully designing and operating Telemedicine service delivery network in rural and remote areas. 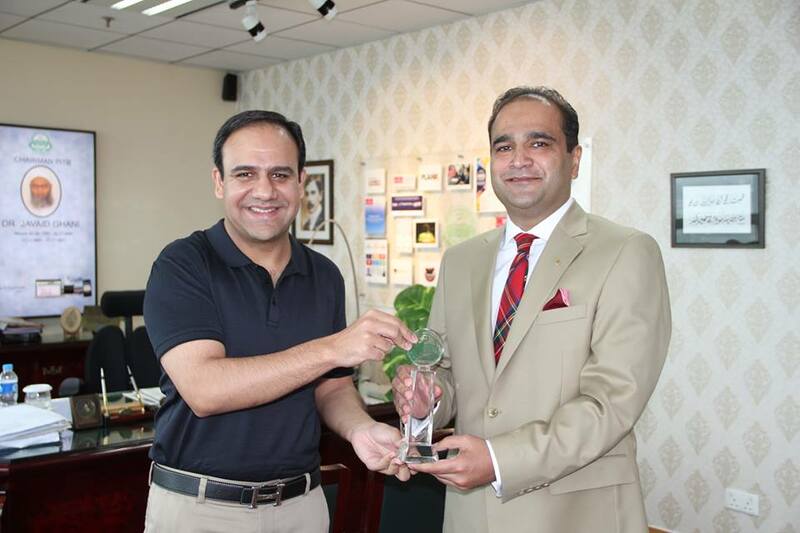 Mr. Jamshed Masood, the Chief Executive Officer of COMSATS Internet Services took the opportunity to thank the Senior Minister Health KPK, Managing Director of KPITB and the team in the KP IT Board for their diligent contribution and hard work to conceive and craft the Telemedicine project in a very short time. He stated that it was an honour and privilege for COMSATS Internet Services to have been selected by KPITB as its partner to develop and manage the Telemedicine facility in Mansehra. He expressed his full commitment to sharing his organizations experience in building the Telemedicine eco system for the people of KPK. Mr. Jamshed Masood emphasized the importance of Telemedicine for communities living in rural and far flung areas. Without this technology; the rural communities would have no access to "life-saving health services"; he said. As the technology evolves; healthcare providers are using telemedicine platforms to manage rural patients with maternity issues as well as for chronic diseases like diabetes, heart disease and other illnesses. Telemedicine services are able to address long-standing complaints of rural communities over lack of access and follow-up care. He complimented the KP IT Board for its visionary leadership which is quick to adopt modern technologies to address the age old challenges of citizen services delivery. He stated that incorporating telemedicine into the overall healthcare delivery strategy of KPK government will radically modernize how healthcare is delivered to patients when and where they need it the most and will be one of the most effective applications of Broadband Internet in the country. 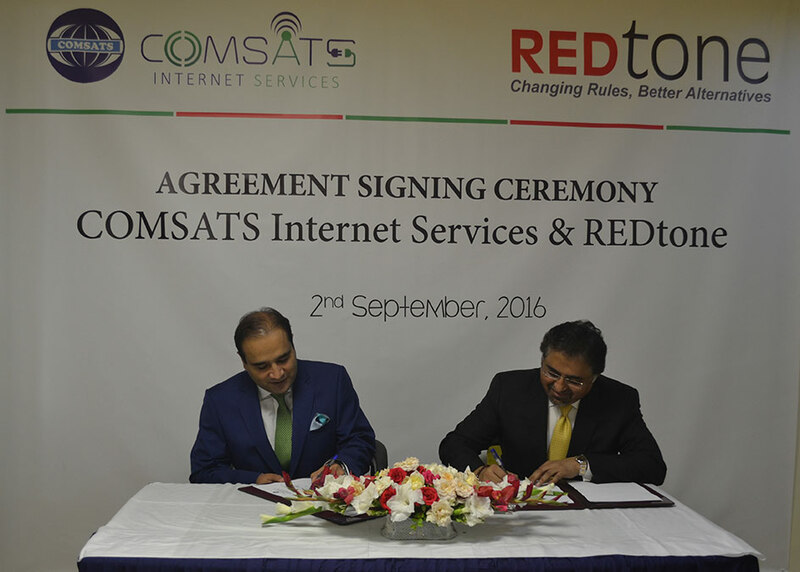 COMSATS Internet Services has signed an agreement with REDtone Telecommunications Pakistan for partnership in satellite broadband internet services. Agreement signing ceremony was held at CIS Technology Park, Islamabad on Sep 02, 2016. 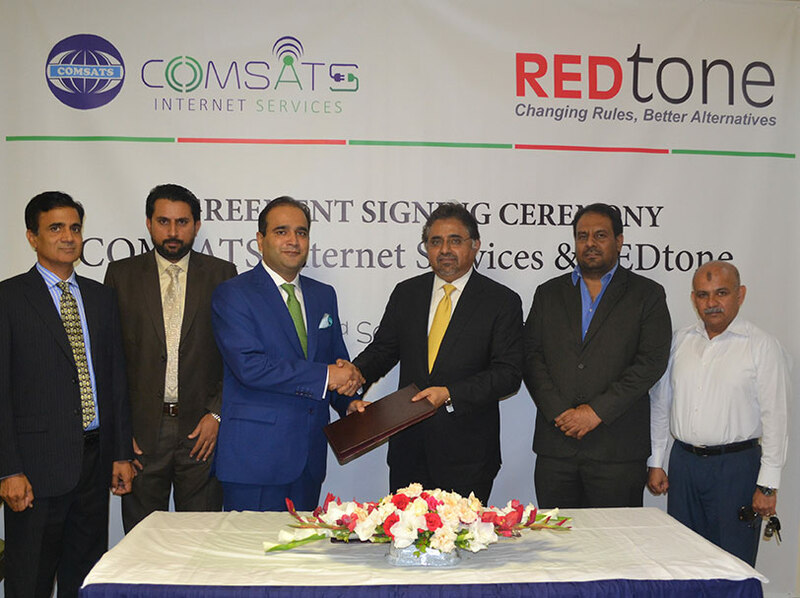 According to the agreement REDtone Telecommunications will connect 50 basic health units across the Punjab over satellite internet broadband services. While expressing his views on the partnership, CEO CIS, Mr. Amir Malik revealed that "Agreement with REDtone Telecommunications will enable CIS to enhance its internet broadband reachability to distant Basic Health Units (BHU) to extend telemedicine services for the underprivileged community. Under this partnership we will further explore facilitations in education and agriculture sectors as well." Nadeem Yunus, Chief Executive Officer of Redtone Telecommunications stated that "REDtone has been working on new approaches to spread connectivity in Pakistan including Yahclick. One of REDtone`s latest initiative is to connect the unconnected in the remote and rural areas of Pakistan to address the health, educational and social aspirations of the unconnected world. 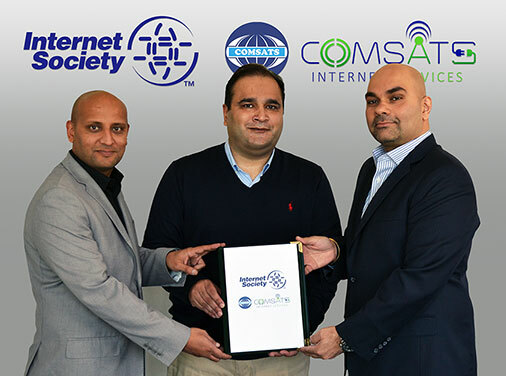 We are proud to be associated with COMSATS Internet Services for the project of Basic Health Units in Punjab, benefiting the communities to connect with the rest of the world." 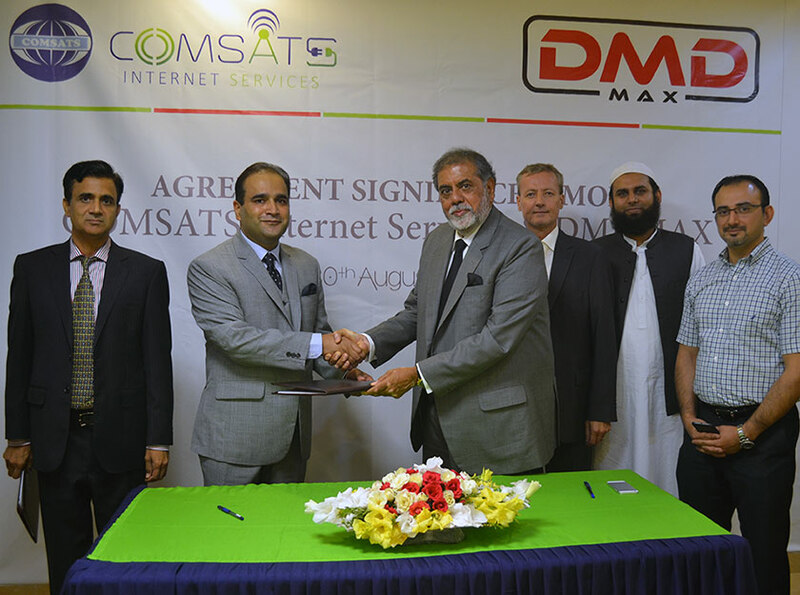 An agreement between COMSATS Internet Services (CIS) and DMD Max has been signed on Aug 30, 2016 at CIS Technology Park for the sharing of data center infrastructure. According to the agreement DMD Max will utilize the data center facility of CIS for its all technical operations in Pakistan to extend its services to his customers in Pakistan and worldwide. On this occasion Mr. Amir Malik, CEO, COMSATS Internet Services, shared his view by saying that "This agreement will lead to great success both for CIS and DMD Max and we are proud to offer our services and in future will also explore new business opportunities jointly in the ICT sector. CIS has established state of the art data center and successfully offering the cloud computing stack services including Virtual Private Servers(VPS). Instead of investing on very expensive hardware, customers prefer to acquire Virtual Private Server (VPS) from CIS. We at CIS pursue the highest levels of corporate responsibility to benefit our valued customers and ensure long-term sustainability." Mr. Majjid Bashir Ahmed, Chairman, DMD Max has said on the signing ceremony ''It is an honor to have the partnership with Pakistan's pioneer company for data center services. They have a dedicated team and the best technical resources. DMD Max as a service provider to mobile operators, have a pride in working with CIS to provide our services to mobile users. DMD MAX created the Mobile TV product to help our partners go beyond the 2 Billion smartphones and penetrate the low and mid-tier device markets that other entertainment providers can't reach. Our target is to reach the mass audience as low end devices still have the highest penetration in the market." COMSATS Internet Services has been awarded Telemedicine Project worth PKR 35.98 Million by Punjab Information Technology Board (PITB). The aim of the Project is to attain Hardware/IT Equipment, Software Solution for Telemedicine and Video Conferencing Solution for 50 Basic Health Units in five Districts of Punjab. New concept of providing basic health consultation by virtualization through effective use of IT being lodged by COMSATS Internet services at 50 BHU'S of five districts of Punjab. 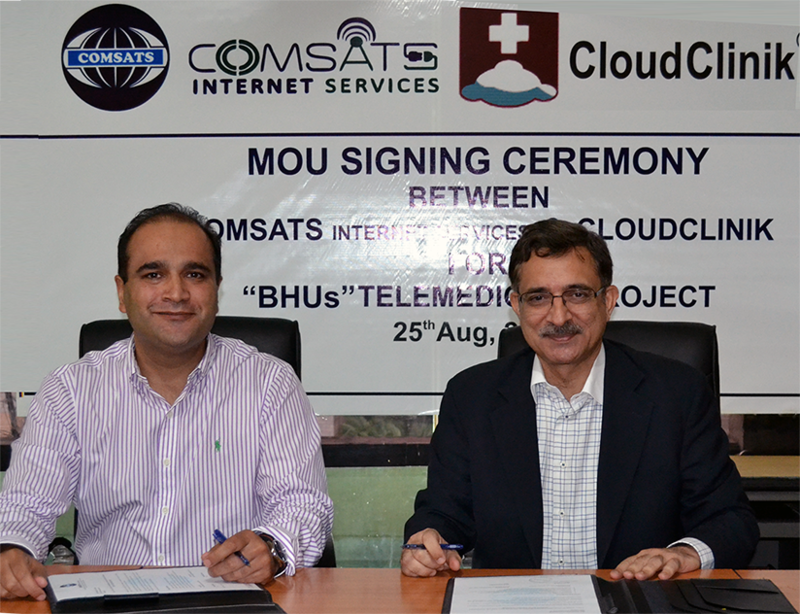 To execute this scenario COMSATS Internet services and INFOGISTIC has signed a covenant to persuade installation of latest IT equipment at BHU'S with intentions to provide un intrupted telemedicine consultation. Both organizations urged to maintain quality and dedication towards professionalism for the betterment of humanity through this unique venture by providing all technical support. This venture will certainly benefit to the people of Punjab where no basic health facilities are available or with high cost. Both organizations will be persuading their noble efforts to implement ICT infrastructure at BHU across Punjab. 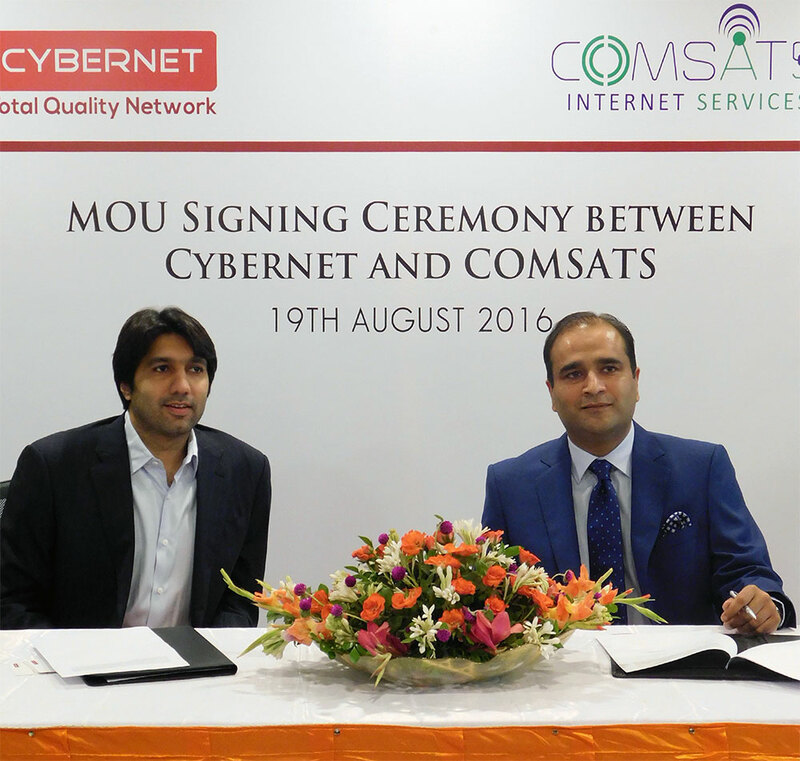 Cybernet and COMSATS Internet Services signed an agreement for provision of wireless broadband services across Pakistan. The agreement shall increase footprint and outreach of both organizations providing better support and premium services of their customers. It will also ensure that both offer diversified services to corporate sector. 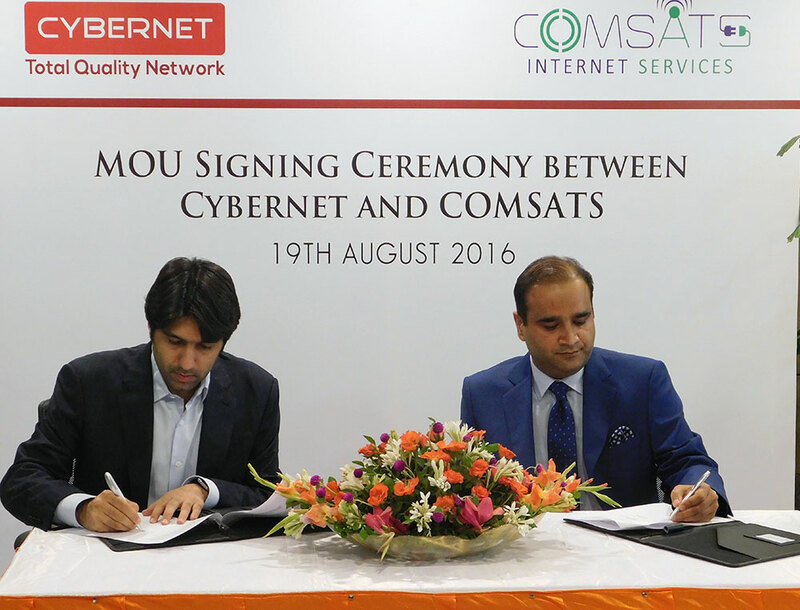 CEO Cybernet Mr. Danish Lakhani expressed his views at the signing ceremony - "It is a distinct honor to collaborate with Comsats on extending Cybernet's reach with low latency wireless internet and data offerings across Pakistan. At Cybernet we take great pride in working closely with our partners - and with whom we can provide high quality solutions to our enterprise customers. I wanted to thank Mr. Muhammad Amir Malik for his dynamic leadership and for his efforts in making COMSATS Internet Services a dynamic service provider, a partner of choice and a force to be reckoned with. I wish both teams the very best in growing this collaboration in areas of mutual interest such as cloud computing, education and training, tele health and others". On this auspicious occasion Mr. Amir Malik, CEO, COMSATS Internet Services, expressed his views by saying that "I am very glad and hopeful that after this collaboration with Cybernet for providing Wireless Internet Connectivity to their clients in all major cities of Pakistan. I believe that not only this collaboration will bring together the best efforts of both the teams, but will help us create new projects. I believe that the future is in multiplying the capacities of individual companies to allow for new products and services to emerge, and with them, a new economic power. The greatest achievements come, when people work together and I have always believed in the power of collaboration." CIS has signed agreement with PTCL for the provision of high capacity bandwidth (Gbps) to meet its internet connectivity requirements in view of rapid business growth. 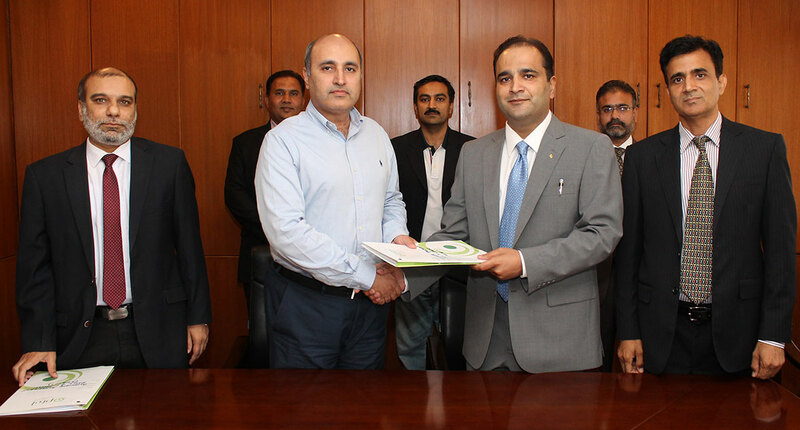 Agreement was signed by Mr. Muhammad Amir Malik (Chief Executive Officer, CIS) and Mr. Kamal Ahmed (Chief Digital Services Officer, PTCL) at PTCL Headquarter, Islamabad on July 22, 2016. TradeSialkot Portal was inaugurated by President Sialkot Chamber of Commerce (SCCI), Major (R) Mansoor Ahmed on 15th June 2016. This is a joint venture for the economic uplift and increase outreach of local industry. 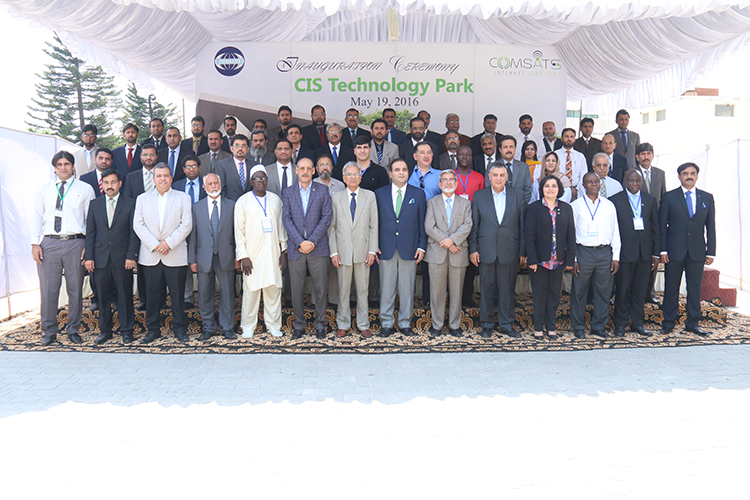 COMSATS Internet Services is proud to announce the establishment of Technology Park, Islamabad. 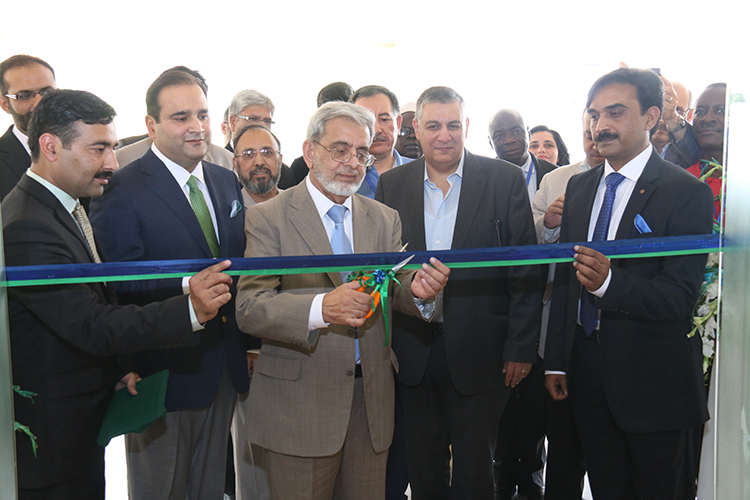 The building was inaugurated by the Executive Director COMSATS Dr. Imtinan Ilahi Qureshi on 19th May 2016. At the occasion, members of Coordinating Council were also present. The total covered area of this project is 45,469 Square feet, which includes the space of 13,754 Square feet for use as a Technology Park. 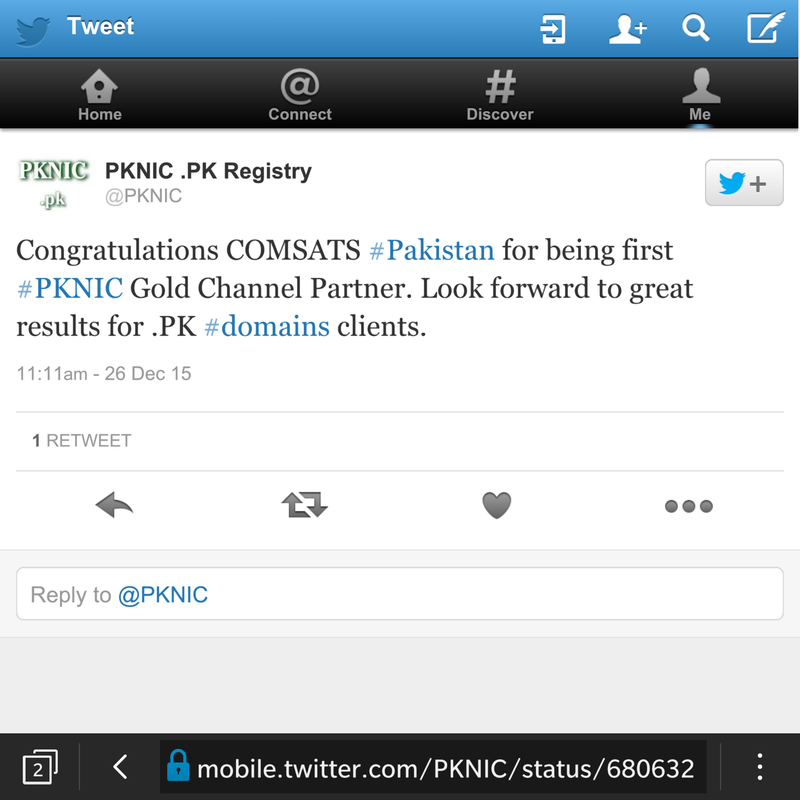 COMSATS Internet Services (CIS) has become the first PKNIC Gold Channel Partner in Pakistan as of December 2015 as part of PKNIC's new class channel partner program which was launched earlier this year. PKNIC is responsible for the administration of .PK domain name space, registration of all .PK domain names, and operations of Root-Servers for .PK domains. CIS can now sell .PK domains with exclusive benefits & opportunities and unique tailored projects & programs. Becoming a Gold Channel Partner with PKNIC allows CIS to offer .PK domain buyers an exceptional experience through the Gold Partner 20% discount, extra volume discounts, domain push, one click hosting plans, and additional value added services. Customers can also expect customized pre-packaged one-stop turnkey website hosting & setup in the near future. CIS looks forward to working closely with PKNIC on exclusive marketing promotions and joint business opportunities in the coming years. Through this partnership, we hope to exceed in building a high-level of trust and satisfaction with our customers. 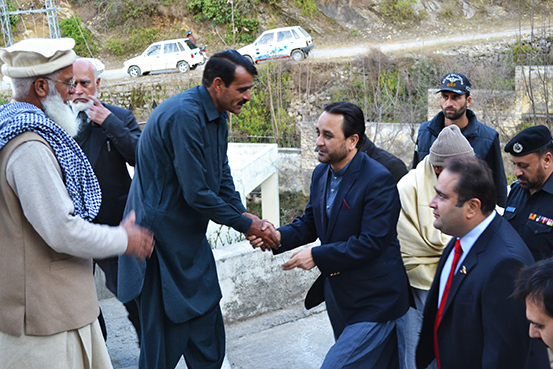 On December 23rd, 2015, COMSATS Internet Services (CIS) had the honor of hosting a visit of the Honorable Chief Minister of Gilgit-Baltistan, Mr. Hafiz Hafeez Ur Rehman, to the CIS Tele-health Unit at Gokina village near Islamabad. On his tour of the Tele-health unit, the Chief Minister was shown how the unit provided free of cost examination to patients in the rural and mountainous village using digital diagnostic facilities and remote specialist consultations. 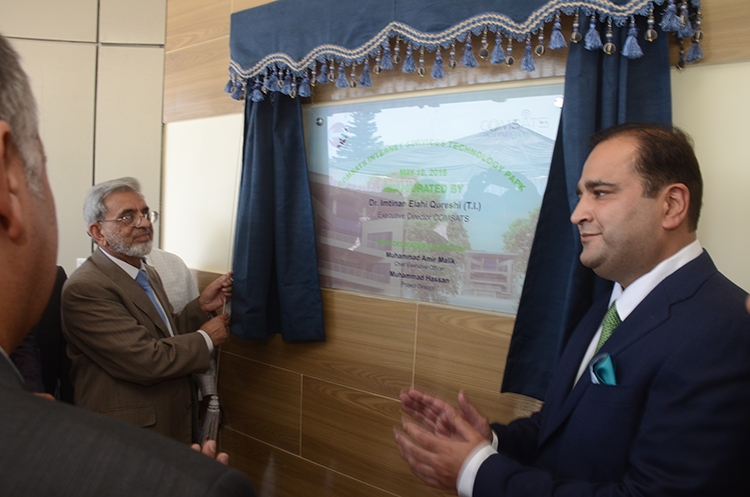 The Chief Minister was highly appreciative of the efforts of the Tele-health unit staff, and also shared a great interest in replicating a similar system of Tele-health centers for the people of Gilgit-Baltistan. 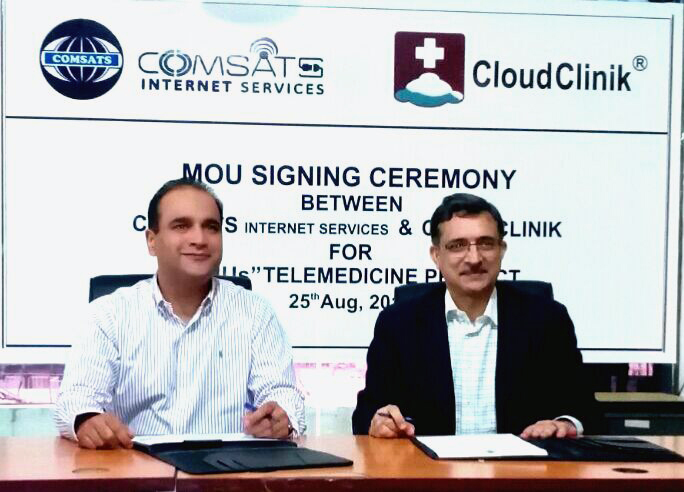 Gokina is one of ten Tele-health centers being run by COMSATS Internet Services providing healthcare services to thousands of patients across Pakistan. 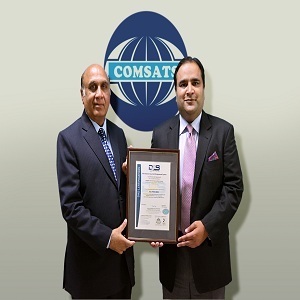 COMSATS Internet Services is on the way to internationalization, in this regard CIS has achieved major milestones of latest International Certification of Information Security ISO27001:2013 for itsDatacenters in Islamabad and Lahore. CIS has also achievedcertification of Quality Management System namely ISO 9001:2008 at Islamabad office. To ensure the sustainability of the certification and continuous improvement, an in-house training for the staff of CIS was held in the October 2015. The CIS staff participated enthusiastically. Today,the certificate distribution ceremony was held at the CIS Headquarters for the training participants. Now the team of trainers and auditors is ready to achieve the other big milestone and become an accreditation body (Certification Issuance Authority) in Pakistan. It is the vision of the CEO that COMSATS Internet Services should collaborate with international certification agenciesto facilitate our country in achieving international certifications and promote trade through standardization. 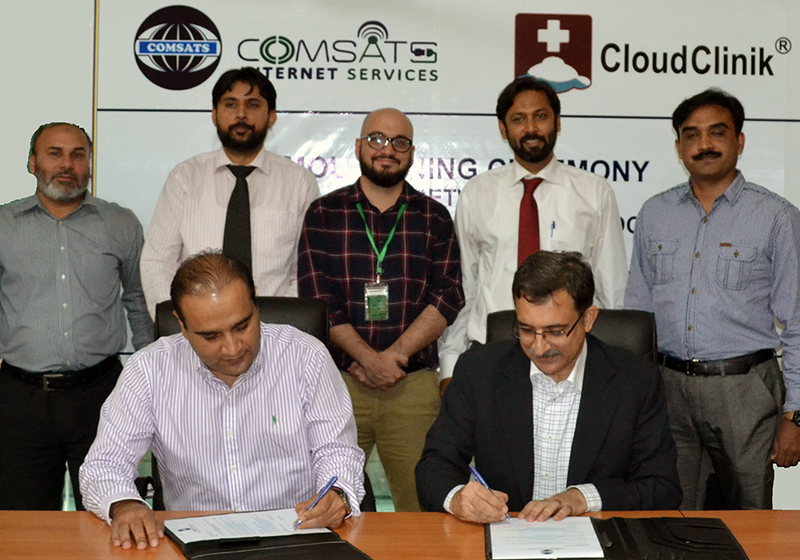 A Memorandum of Understanding (MOU) was signed between the Internet Society (ISOC) and COMSATS Internet Services (CIS) to establish a pilot project under its flagship Wireless for Communities programme in a rural community of Chak Faiz located near Multan. The Wireless for Communities Programme is an initiative of ISOC which provides Internet access to underserved rural communities using a community empowerment approach through WiFi based technologies. The programme also provides training to the community on content and services, and helps the community maximize development opportunities using the Internet. ISOC has been successfully implementing the Wireless for Communities programme in South Asia for the past five years. The programme has also won two international awards, from ITU/MCMC and Public Affairs Asia, respectively. The project will include deployment of a wireless community network, together with training for the community. It will be executed over a couple of phases to help empower the community to harness the benefits of the Internet and how it can enable social inclusion. Rajnesh Singh, Director of the Asia-Pacific Bureau of the Internet Society stated - “The Internet is probably one of the greatest, and most transformational, inventions of humankind. We need to ensure that all communities, regardless of whether they are located in rural or urban areas, are able to fully benefit from the Internet and all that it can enable. 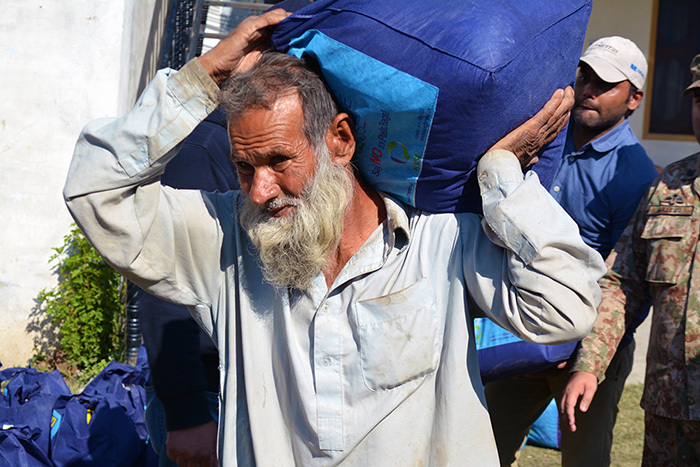 With this pilot project in Pakistan, we hope to be able to demonstrate a suitable community model in the country which could be used to help expand access to rural and underserved areas”. 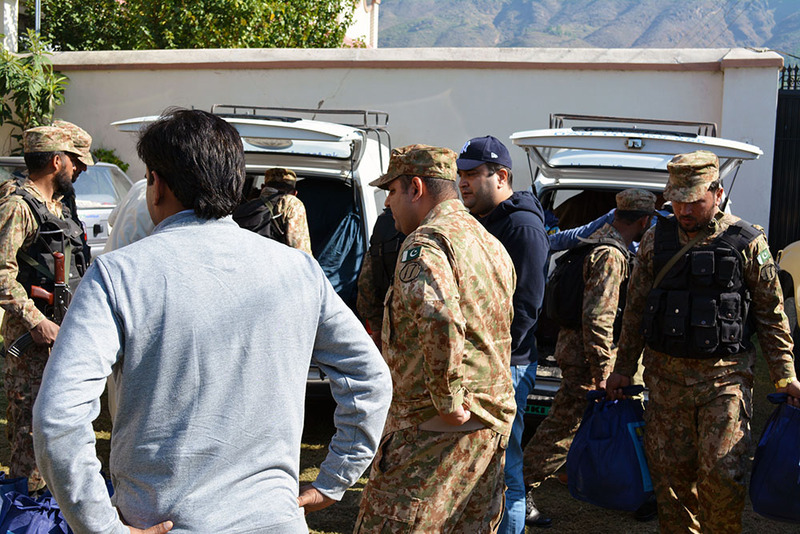 31st October 2015 – In the wake of the devastating earthquake on the 26th of October, 2015, COMSATS Internet Services made it a point to be an integral part of the relief efforts. 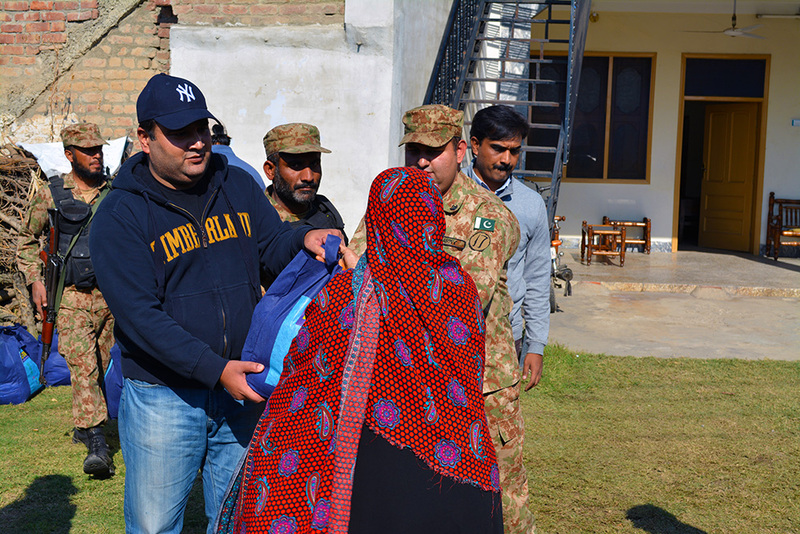 The CEO along with his team went to the affected areas in-person to make sure that the relief reached the affectees. 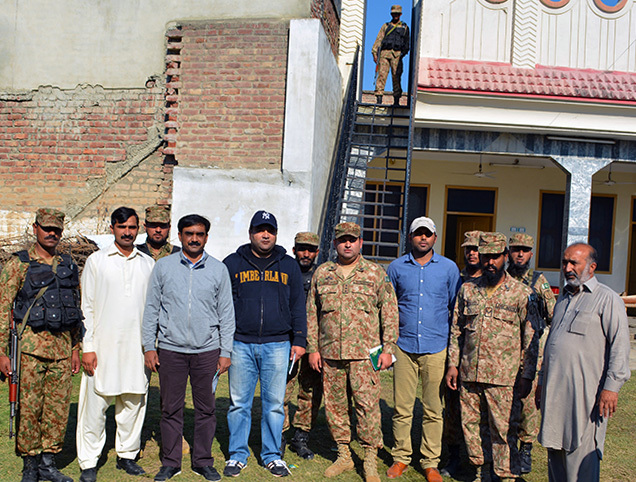 The areas visited included Mingora, Khwazakhel and Malam Jabba. 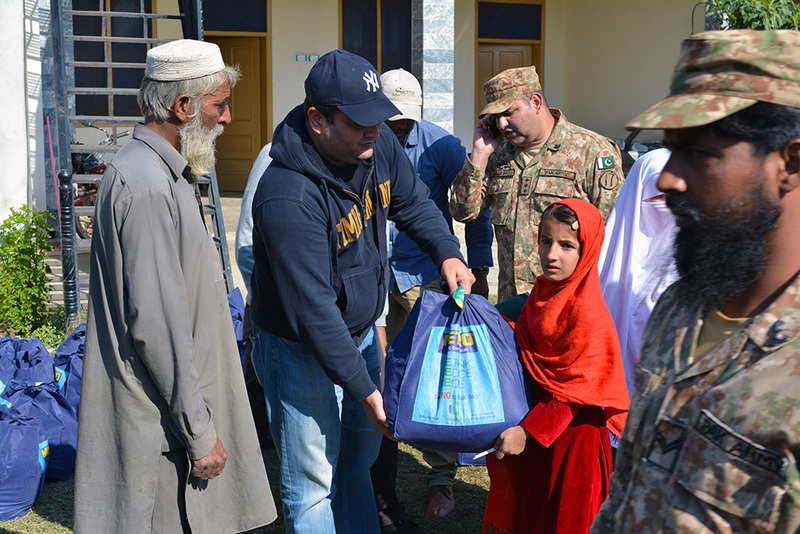 Over a hundred packages (containing water, flour, rice, pulses, sugar, tea and milk) were distributed among the affectees with the assistance of the Army and local officials to make sure that the process was completely transparent. COMSATS Internet Services (CIS) and A.F. Ferguson Co. Ltd have signed MoU to collaborate in IT enabled products, services and other related projects including ERP implementation based on their individual capabilities and expertise. CIS offers a variety of Internet access services ranging from Virtual Private Servers, Broadband Internet Connectivity through E-1, Datacenter Facility, High Speed Broadband Wireless links, Website Hosting, Domain Registration, Software Development, Video Conferencing, Virtual Private Networks Setup and Optical Fiber for corporate and residential users. A. F. Ferguson Co. Ltd is a member firm of PricewaterhouseCoopers (PwC) Network. It is one of the leading ERP solution providers and have experience in the execution of large scale IT projects. The company is a certified Diamond Partner of Oracle Corporation. The firm provides an extensive variation of ERP and information technology (IT) services including implementation, upgradation, quality assurance, project management, audit and support services on numerous platforms including Oracle ERP. Upon signing this MoU, Mr. Irfan Faruqui, Partner A. F. Ferguson Co. Ltd stated: "IT has become critical to the operations and competitiveness of organizations around the world and is one of the major expenditures of an organization. The main aim of this collaboration with CIS is to achieve integrated IT systems requirements and foresee future IT trends in Pakistan." Mr. Amir Malik, CEO CIS shared his views: "This collaboration is a step towards providing our clients with upgraded IT management systems. A. F. Ferguson is a prestigious organization and this collaboration will open new horizons to the development of IT sector in Pakistan. IT is an utmost requirement of every organization and we will collaborate to deploy integrated and upgraded systems." 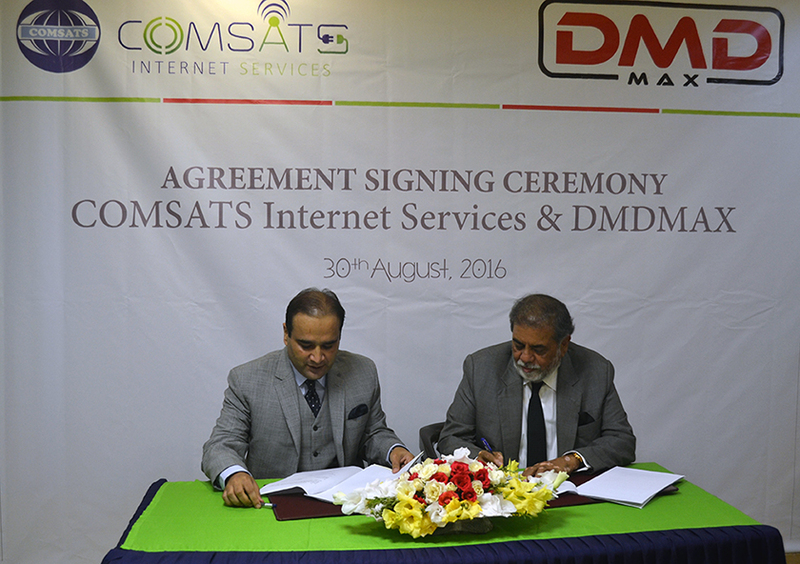 12 August 2015 –COMSATS Internet Services (CIS) today announced the successful implementation of DomainName System Security Extensions (DNSSEC) in Pakistan. This initiative, along with the recent deployment of L-Root servers in Islamabad and Lahore,and the launch of aRIPE Atlas Anchor (sponsored by APNIC), is the result of CIS' research and development activities to help improve the experience of Internet users regionally and globally. The Domain Name System is the backbone of the modern Internet and DNSSEC is a valued tool thatsupports the integrity of the DNS. The adoption of DNSSEC around the world is increasing rapidly because it has become fundamental to the development of a safe and reliable Internet. "DNSSEC will bring new prospects and opportunities to Internet users," said CIS Chief Executive Officer Amir Malik. "CIS is very keen to work with the Internet community to ensure the success of DNSSEC broadly. By implementing DNSSEC, we hope to strengthen users' trust by helping to protect their websites from cyber attacks.New service offerings, such as zone signing, can be generated and it will help us initiate secure data transactions. We expect these additional features to be attractive to security and reputation focused users." The Domain Name System holds a pivotal position in the Internet's infrastructure and it has been the target of a variety of cyber attacks since its inception, including having been embedded with malicious software and redirecting users to fraudulent websites. Protecting this infrastructure became mandatoryto ensuring it functions properly.DNSSEC technology benefits security aware servers, as it ensuresthem that information obtained from another server is secure and authentic. Essentially, DNSSEC protects data by utilizing a digital signature. To guarantee the authenticity of DNS records, DNSSEC uses public key cryptography signatures. In addition to that, it also affirms "non-existence of records." DNSSEC must be deployed at each step in the lookup from root zone to final domain name (e.g., www.yourwebsite.example) in order to eliminate vulnerability from the Internet. Full deployment of DNSSEC will ensure the end user is connecting to the actual website or other service corresponding to a particular domain name. 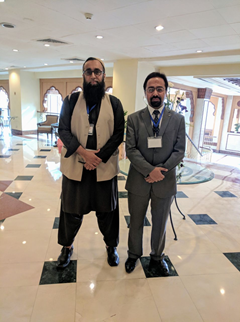 "ICANN applauds CIS' implementation of DNSSEC in Pakistan," saidBaherEsmat, ICANN's Vice President,Stakeholder Engagement – Middle East,"Internet Service Providers and Enterprises who have not yet implemented DNSSEC are encouraged to follow suit and play a role in strengthening the security and reliability of the Internet." COMSATS Internet Services (CIS) has inaugurated its office in Gujranwala. 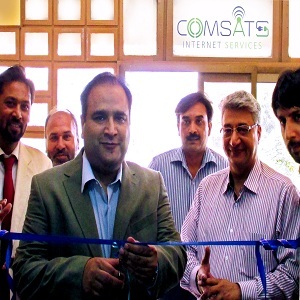 The inauguration ceremony was attended by CIS Chief Executive Officer Mr. Muhammad Amir Malik along with the Node Head, managers and staff.With the launch of this new office, CIS has taken another leap to provide internet excellence round the clock.The Gujranwala office will allow CIS to get closer to the consumers and address their needs more quickly. This office will also create more job opportunities in Pakistan hence making a positive contribution to the economy. "At COMSATS Internet Services, we are committed to our vision of being indispensible by providing the most reliable internet solutions toour people. 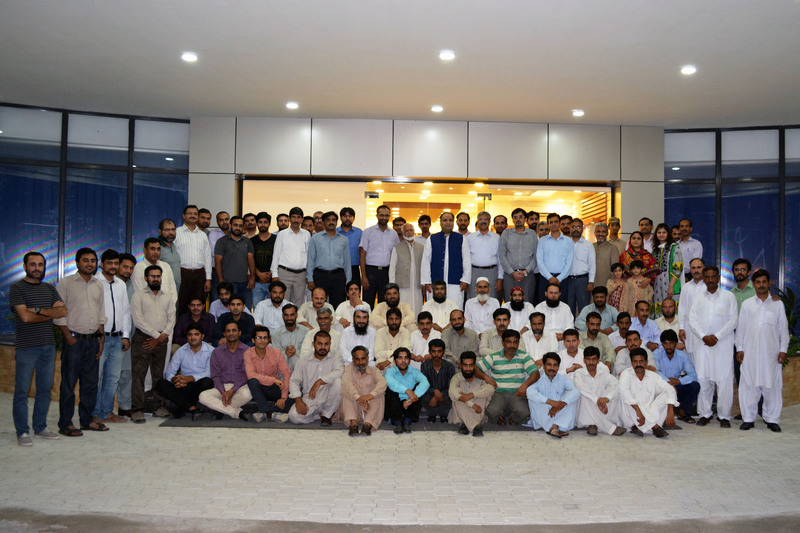 CIS wants to remain at the forefront of innovation with a customer centric approach, andthat is the key to success for us at CIS,"
COMSATS Internet Services (CIS) hosted its annual Iftar dinner at the CIS Headquarters. The Iftar dinner was attended by the CEO, General Managers, officers and staff. 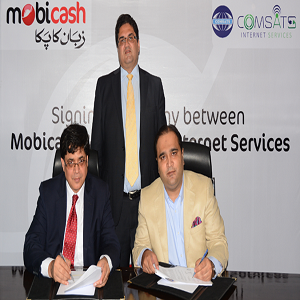 Mobicash and COMSATS Internet Services (CIS) have signed an agreement whereby Mobicash will provide bill payment solutions to the customers of the internet service provider. Through this agreement, CIS' customers will have the option of making payments through their mobile account and Mobicash outlets located close to their homes. This initiative provides payment flexibility and ease of access to CIS's customers, which is one of the prime benefits of Mobile Financial Services. Speaking at the ceremony, Mr. Bilal Munir Sheikh, Vice President Mobilink said; "Mobicash is continuously expanding its footprint in terms of outreach as well as services that we offer to bring convenience to our customers' lives. Partnering with COMSATS Internet Services, the pioneer ISP of Pakistan, for bill payment solutions is another step towards enhancing customer experience in urban parts of the country and our continued endeavor to bridge the financial gap in the under and unbanked areas of Pakistan. 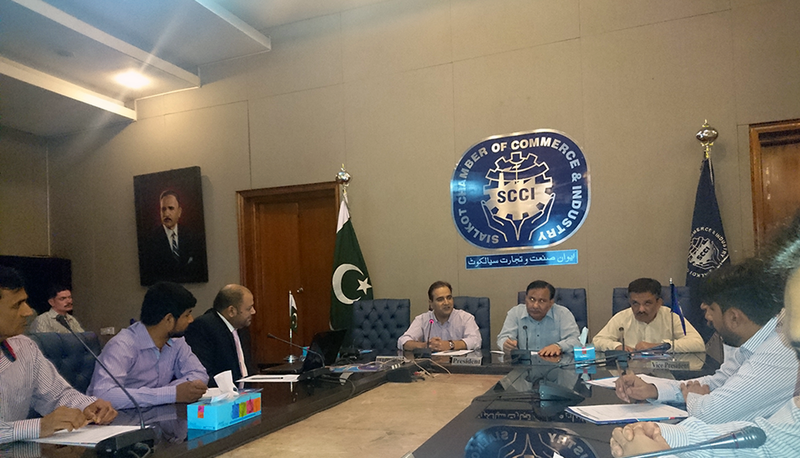 We shall continue to develop similar relations to maximize the benefits available through the usage of our extensive branchless banking network"
Mr. Amir Malik, CEO COMSATS Internet Services expressed his views by saying "signing this document will facilitate CIS customers in their payments, especially for customers in remote areas where banks are not available in their vicinity. This will promote the growth of our organization and give us an edge over our competitors. We are proud of our partnership with mobicash for payment collection. This is a big step towards the future and we are very proud to be a part of it." Payments through Mobicash mobile account can be made by the users through their phones by just feeding in their CIS customer ID. For making payments through Mobicash outlets located across the country, customers will have to provide their CIS customer ID to the retailer for real time processing of the bill. The payment will be instantly marked against customer ID directly into CIS' account. For ensuring transparency, a confirmation message will be sent immediately to the customer once the bill is processed. 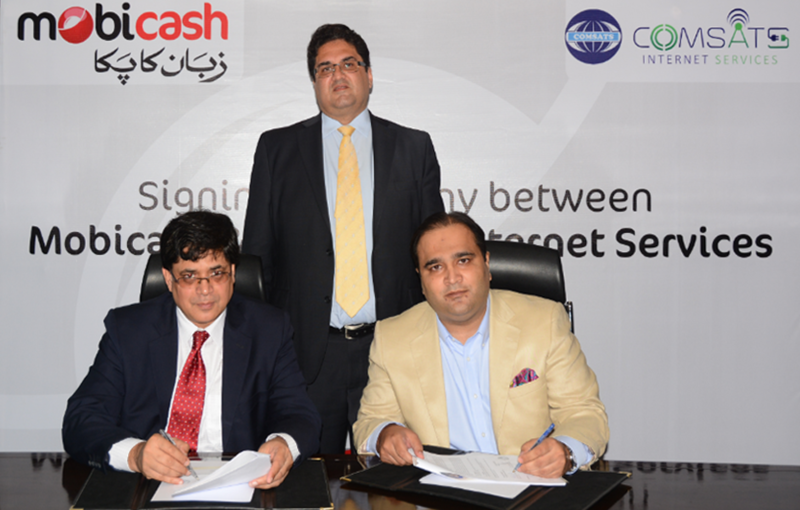 Payments can be made at any of the 55,000 Mobicash outlets across Pakistan even during non-banking hours. CIS and Mobicash will also set-up a 24 hours help-line support to assist customers with their queries. COMSATS Internet Services (CIS) being the pioneer internet service provider in Pakistanhas successfully deployed L-Root mirror server in Pakistan. This is a joint venture between CIS and Internet Corporation for Assigned Names and Numbers (ICANN), the organization responsible for administering and coordinating the Domain Name System (DNS) worldwide.On a background note, the root-servers are core of the Internet DNS, identified by letters A through M.This new L-Root instance in Pakistan will strengthencountry's DNS operation, overall fault tolerance and its resilience against certain types of cyber threats such as Distributed Denial of Service (DDoS) attacks.ICANN is accountable for assigning distinctive numeric address to each domain throughout the world, making it easier for the server to locate that domain. ICANN undertakes key technical services which are critical for the undisrupted operation of Domain Name System (DNS). 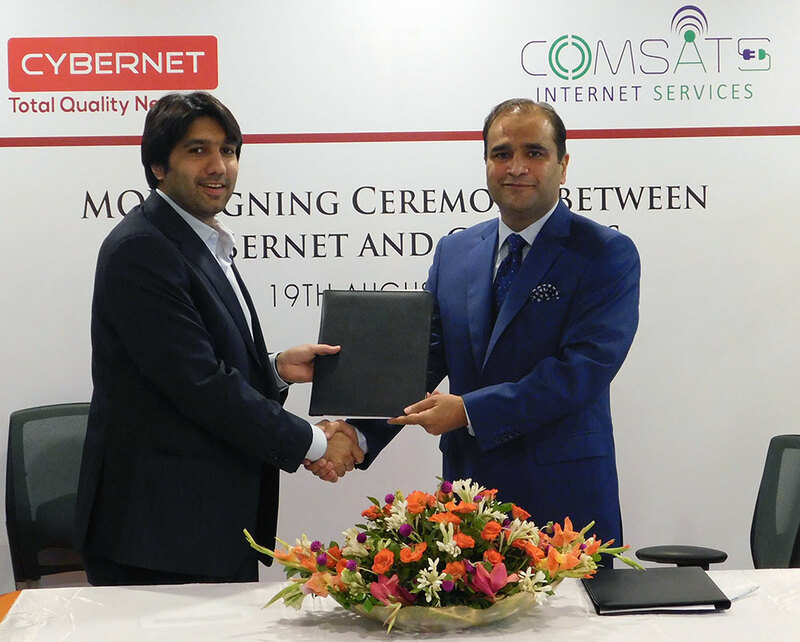 "We are very pleased with this partnership with COMSATS Internet Services, and to see the second L-root instance deployed in Pakistan. ICANN continues its efforts to strengthen the stability and resiliency of the Internet naming system and we look forward to working with other partners in Pakistan to bring in more L-root instances into the country," said BaherEsmat, ICANN Vice President for the Middle East"
This means internet users will experience areduce response time when making DNS queries. This collaboration by both organizations is a step towards more resilient, stableand secureInternet for Pakistani users. "CIS being the pioneer of Internet service provider in Pakistan has always foresighted the use of internet and has been efficacious in facilitatingour users with consistent internet services. This collaboration with ICANN is another effort in which our main aim is to provide instantaneous and unwavering internet services for its users. This will help us in managing a better and more integrated server system. The introduction of the L-Root mirror will significantly increase the inter-networking efficiency of country's Internet infrastructure. It will not only benefit our Internet users, but also provides a firm basis to promote overall eco-system. This L-root server instance is IPv6-enabled, which will help in maintaining functional DNS service on IPv6 locally. This opportunity holds a vital role in encouraging the local community to yield optimum advantage of this instance by adopting IPv6." COMSATS Internet Services is pleased to report its accomplishment of ISO 27001:2013 certification for Information Security Management. 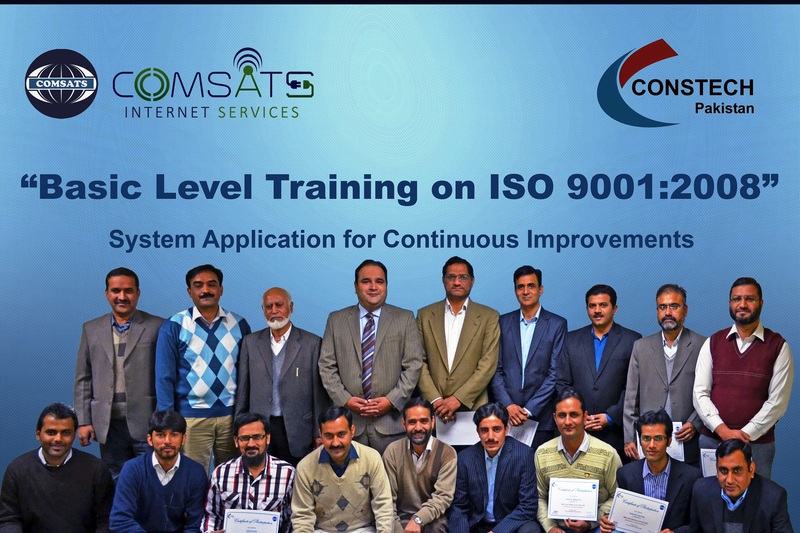 By accomplishing the internationally acknowledged ISO 27001 certification, COMSATS Internet Services has shown its dedication to Information Security Management, and flagged the further reinforcing of its certifications as an oversaw administration supplier. Adding this accreditation to the credentials shows operators as well as industry regulators COMSATS Internet Services' dedication to consistent change in Information Security standards. This dedication is in immediate reaction to our clients' necessities of securing themselves in an evolving threat landscape. ISO 27001 is an internationally recognized information security management standard which guarantees organizations can apply a structure to business methods to help recognize, oversee and reduce dangers to information security, and considers IT as well as all business operations. ISO 27001 certification accomplishment shows an association's capacity to meet compliance requirements, which thusly builds outer and inward consumer loyalty. While before, accreditation levels were needed of suppliers to the enterprise market; the same affirmations are progressively looked for by organizations of any size, with an end goal to manage risk inside the business and secure the information it depends on to perform. 'This is a key fulfillment for us. Ultimately, we need to consistently enhance the services we offer to our clients, and are pleased to have the capacity to add to our accreditations, demonstrating our preparation to meet our clients' compliance requirements,' says Muhammad Amir Malik, Chief Executive Officer of COMSATS Internet Services. 'We work constantly to guarantee that we not only meet, but surpass the prerequisites of a growing organization serving a demanding industry. We have an enormous hunger for guaranteeing that our clients get the advantage of thorough yet quick business forms and powerful security frameworks. This is a significant venture forward in COMSATS Internet Services showing its dedication to Information Security Management and will decidedly help in co-working with our clients' compliance requirements,' he includes. With ISO 27001 certification and the definite competitive advantage it brings, the organization anticipates finding alternate focal points that are enjoyed as a certified organization. With the structure set up to meet the prerequisites, COMSATS Internet Services discovers a way to constant operational upgrades for the advantage of its clients; a way which will empower the organization to broaden its services portfolio and client base. COMSATS Internet Services (CIS) becomes the first ISP in Pakistan to host RIPE Atlas Anchor sponsored by the Asia Pacific Network Information Centre (APNIC). The RIPE Atlas project is an Internet measurement network that employs a global network of probes and anchors for the real time measurement of Internet connectivity. The Ripe Atlas Anchor is a more powerful version of the probe with a much greater measurement capacity. The anchor helps gain valuable information about the health of our network by measuring ping, traceroute, DNS, and HTTP(S). In addition, the anchor acts as a powerful regional target for the RIPE Atlas Network to handle a large number of measurements originating from nearby probes. 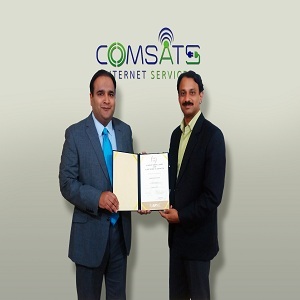 On this achievement, M. Amir Malik, CEO of COMSATS Internet Services said, "CIS was the pioneer Internet Service provider in Pakistan, and continuing with this legacy, we are the first to initiate the installation of the RIPE Atlas Anchor with the outstanding support of APNIC. This will help in enhancing our integration and system to guarantee that our clients in Pakistan get the best internet experience. We will now have comprehensive and accurate information about the internet, and can investigate network glitches in real time at the anchor, understand the precise issue, and resolve it immediately." This accomplishment allows the Internet community in Pakistan to now get on-request individual estimations from the RIPE Atlas anchor that will give instantaneous information on their queries. Atlas Anchor is the next generation active Internet measurement network initiated by RIPE NCC and sponsored by APNIC in the Asia Pacific region. It consists of thousands of measurement probes distributed around the globe. Anchors provide valuable information about the local and regional connectivity and reachability of the Internet, and the large amount of data they collect is made available to everyone. Pakistan network operators can use these measurements to understand the health of Internet around their network. Network operators can also measure latency to their multiple locations and their customer experience with different sites/locations that help resolve any issues and visualize network outages. If a customer mentions about a slow Internet connection, or packet loss and/or jitter, we can now verify against accurate data and troubleshoot connectivity issues in real time at this Anchor in Pakistan, understand the issue with a lot more clarity and accuracy, and solve it instantly. 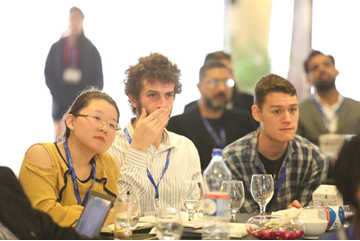 Duncan Macintosh, APNIC Development Director said "as of today the Internet community in Pakistan can get real time measurement of the Nation's Internet infrastructure from within the country and outside. 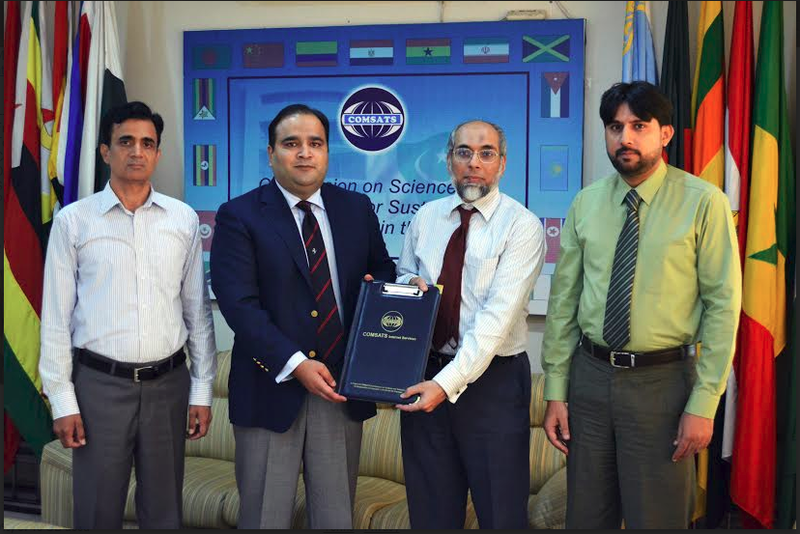 APNIC is very pleased to have COMSATS cooperation in hosting an Anchor in Pakistan." Macintosh further added "The 'Atlas Anchor' provides an unprecedented understanding of the state of a country's Internet infrastructure in real time. All the data collected by the Anchor is made available to everyone for free to do their own analysis to help build better Internet infrastructure in the region".